Today I got a second broadband connection at home (the primary is a HFC cable connection). Using the Snap-provided Fritzbox and a new connection (Chorus installed a new phone point here, before we found there was one somewhere else in the house, but disconnected). The connection is maxing at 10Mbps because we are at some distance from the exchange (1.6 Km length, cabinet is passive). The Fritzbox is pretty cool - even though lots of the settings are "hidden" I had no problems setting up a second VoIP line (mynetfone AU) to use with it. Currently uploading a new folder backup to Crashplan and getting about 1.2 Mbps up speeds - impressive for a DSL connection seeing my "130Mbps/10Mpbs" cable connection only gets about 500Kbps to Crashplan due to Vodafone's strange routing to Australia - also noticed Geekzone is only 30ms away while on Vodafone we're 150ms (again because of Vodafone's strange routing). Out of interest will you be operating any sort of selective routing or load balancing between the two, or is it completely separate and some are connected to one and some to the other? Currently I have the HP server connected to both the FritzBox and MP264. Internet access is via Fritzbox only while the MP264 makes it visible to the home LAN. Later I will test NIC teaming (the HP switch supports it). Welcome to Snap. They may not come tops in terms of performance measurements, but I think that their real world performance is good. We have snap at home, while my work connection is with another provider. The internet just feels 'snappier' at home, while the work connection lags when loading sites like stuff. One of the things I like about snap is that they roll out plan improvements to their existing customers too. This means that as an existing customer, in my experience, you don't have to ask for the amazing deal that a new customer is getting, you just get it the next time your billing date rolls around. As an example, when I joined my base allowance was 5 GB, now its 50, and I haven't had to lift a finger to get the increase. One thing that might get me this month is their additional data is _way_ more expensive than the first block you add on on a monthly basis. Im going to call them up to query it if it looks like I will run out and possibly defer furthur crashplan backups till next month if I will run out. I thought they had free evenings? They do, but upload to crashplan during the evening is much slower than during the day. Nice one, they really are outstanding IMO. Currently uploading a new folder backup to Crashplan and getting about 1.2 Mbps up speeds - impressive for a DSL connection seeing my "130Mbps/10Mpbs" cable connection only gets about 500Kbps to Crashplan. I was very impressed with their Crashplan Australia performance too recently. When I first signed up to crashplan and changed to their Australia server I was getting around 3Mbps. When my plan came up for yearly renewal the other day I dumped some large home videos into my backup folder and they uploaded at 9-9.5 Mbps - it was pretty close to line speed for my VDSL. Was impressed enough to renew Crashplan for another year. Here's an interesting thing: running the Crashplan backup and downloading a Windows Update for a VM (900MB, SQL Server SP1 for SQL Server Management Studio). Both directions using 100% of available DSL speed. On my cable connection the Crashplan upload is only about 5% of the publicised max upload speed (10Mbps) and the Windows Update downloads usually max at around 8Mbps (around 6% of the 130Mbps max download speed). 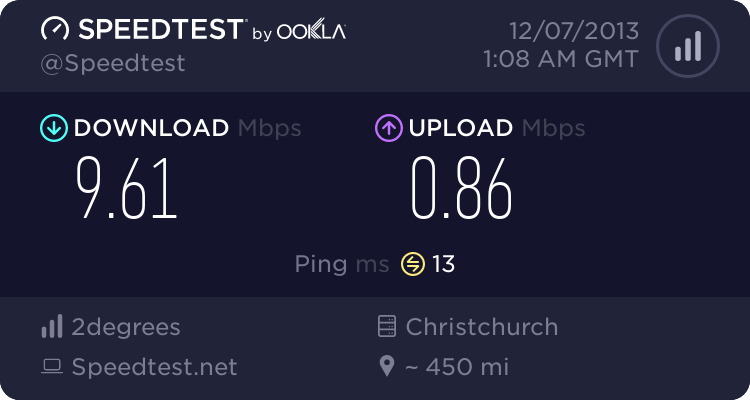 At the end of the day for this specific use case I am getting as much from the ADSL2+ connection that I'd get from the cable connection. Obviously if we talk about more people sharing the connection (e.g. streaming a movie while someone else is updating a PC/Mac and other computers doing their backups) then the cable would have an advantage of spare capacity. That sounds rather pathetic to be honest. Do Telstraclear/Vodafone not have Akamai caches in NZ reachable from their cable network? At a guess your crash plan data is probably taking the scenic route through Southeast Asia rather than directly through peering in Australia. Correct, this has been talked at length with Vodafone and nothing really changed over the years. Today we had a Chorus visit. The connection was dropping frequently and speeds varying from 1 Mbps to 8 Mbps. We spent some time around including using a test tool and after a while it came down to some cable needing a bit more punch. Thanks to Chorus for showing up on a Saturday! Right, so now the connection has been up for ten hours without dropping even once. Before that during our tests with the technician we saw it drop four times in five minutes. I guess it's fixed now... Back on doing something large upload again to test times/speed. I am considering switching to Snap ADSL2 service. I've been with Slingshot for the past two years but it's been quite frustrating with connection dropouts in the evening on most nights. I did come across the TrueNet Broadband Report and noticed that Slingshot was the worst performer in the evening compared to other ISPs. I also had a Master Splitter installed and purchased a Draytek router recently but it hasn't prevented these connection dropouts but has slightly increased download/upload speeds. Can't get Fibre and VDSL2 in my area. Just curious for those currently with Snap, is it worth switching? Price isn't too much of an issue but really what I'm looking for is speed consistency in the evenings as I do game quite a bit. I also have two family members who use YouTube quite a bit and just wondering if there isn't alot of buffering etc with Snap. Youtube works great on snap most of the time. I have seen the TV back off from a HD version down to something blurry on occasion, but that is on just uploaded stuff so its possible its not properly on the cache or something at that time. Other than that its buffer and stutter free almost every time. I have had random music video playlists on for hours at a time without a glitch or anything.